VOICE ON THE RADIO OUT NOW. Available on all streaming platforms, and available for purchase directly through our shop. Thank you for your continued support! Formed in 2015, The Great Enough did the usual grind, playing live shows and sweating it out in rehearsals to refine the bombastic gut punch sound that one radio personality dubbed "Soulternative." In 2017, the song "Can You Relate?" went viral on Spotify, netting over a million streams. That led to radio appearances and bigger shows, which culminated in a sold-out headline at the legendary Underground Arts venue in Philadelphia. 2018 saw the band opening stadiums and arenas, including two iHeartMedia festivals. Their tour schedule has landed them on stage with Imagine Dragons, Judah & the Lion, Mike Shinoda, Fuel, Eve 6, Sister Hazel, AJR, Sir Sly, Missio, Fastball, Cracker. The new album BORN hit the Internet on July 6 and the band played to an energetic capacity crowd at an album release to celebrate before getting back down to the business of making music. The band began 2019 with the Winter Jawn Festival, supporting Young the Giant, Matt and Kim, and lovelytheband. Spring and Summer tour dates coming soon. Recorded at The People's Music Studio, Los Angeles, California and Noisy Little Critter, Downingtown, PA.
"If Counting Crows were fronted by a grittier, bluesier Adam Lambert, they'd sound like The Great Enough. Bright Kelly has the best set of male vocals in the City of Philadelphia." "Love their music. Take a listen and enjoy." "The steady building track [Can You Relate?] builds to a climactic chorus, and shows how the power of music connects people. The ringing refrain [...] is a reminder that there is nothing more audacious or more rock and roll than hope." "A lush, almost anthemic alt-rock track." "The City of Brotherly Love has once again delivered us sweet, gentle aural care in the form of [their] soul-drenched new single." "Get ready for a throwdown..."
Recent News: The Great Enough selected for the East Coast Music Conference along with Ice T, Kevin Lyman, Carousel Kings, and more. 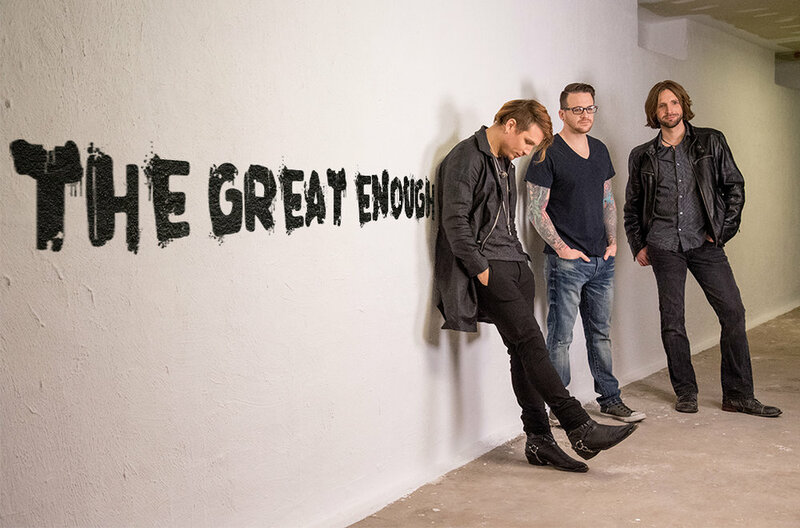 The Great Enough will also open for The Wallflowers, as well as a second appearance with Eve 6 - in addition to club performances with The Unlikely Candidates and The Brevet. In 2018, The Great Enough shared stages with Imagine Dragons, Judah & the Lion, AJR, Sir Sly, Mike Shinoda, Missio, Cracker, Glorious Sons, The Wrecks, Fuel, Eve 6, Sister Hazel, Fastball, Long Beach Dub All Stars, and more - and with upcoming dates including some more household names. New Single “Voice on the Radio” premiered by WXPN’s Helen Leicht, and also played on major iHeartRadio FM stations. Selected for Main Stage performers at Winter Jawn 2019 festival with Young the Giant, Matt and Kim, lovelytheband, and The Interrupters. Side stage included Bob Moses, Keuning, and more. A complicated poet with generations of soul in his blood. A happy-go-lucky rocker with a tame tornado in his fingers. A United States Air Force war veteran with a kick-drum heart. Their particular brand of vital, intense rock and roll has drawn comparisons to artists as varied as The Killers, The Gaslight Anthem, and The Lumineers. Draw your own conclusions. The Great Enough is not interested in self-labeling. They want you to decide, for yourself, what they mean to you. If we are to let the music speak for itself, it will tell you that these guys work hard and care deeply. That they are exploring the human experience in as honest a way as they are able. That they want to laugh with us, and rage with us; they want to feel our loneliness and our exultation; that they want to roar. Everything else is up to you. BORN released July 7. The album features a guest appearance by Chuck Treece of Bad Brains. The singles “Inexplicable” and “Bowerbirds” are in current FM rotation. Over 1.1 million streams or downloads. In rotation (iHeartRadio, Radio 104.5, i99FM, y102) on terrestrial FM radio, internet radio, and all streaming services. Featured in Round Magazine, Skope Magazine, New Millennium Music, PureVolume, The Hook Journal, and many more.